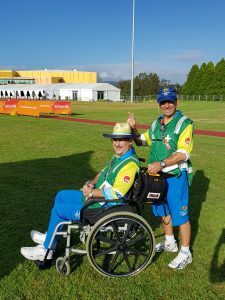 The Gold Coast 2018 Commonwealth Games (4 – 15 April) has just concluded and while the focus of the Games has indeed been on the athletes, the success of the Games is also testament to the collaboration and hard-work of the volunteer medical team. Medical personnel from across Australia, including doctors, physiotherapists, nurses, sports trainers and paramedics, generously shared their time, expertise and energy to support the athletes throughout the Games – all on a voluntary basis. Many of these volunteers even took on the expense of transport and accommodation to the Gold Coast. 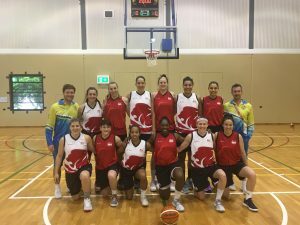 This was only the second time at a Commonwealth Games that sports trainers had the opportunity to be involved as part of the volunteer Medical Team. Around 10 SMA Sports Trainers were selected including Laurie Farrugia, Peter Felton, Matt Harris, Russell Henry and Michael McGuinness. These trainers were based at varied locations during the Games – from the velodrome to the gym, the athletics track to the shooting range. SMA Sports Trainer, Laurie Farrugia was part of the Medical Team stationed at the athletics warm-up track in Carrara, where he worked for 10 days, averaging about 9-10 hours per day. A typical day at the warm-up track would see Laurie participating in a daily Medical Team hand-over briefing covering any potential issues and challenges for the day, and reinforcing the specific protocols around medical intervention at the various sporting events, while working in with the procedures of other medical teams for larger Commonwealth nations including Australia, Canada and England. SMA Sports Trainers, Laurie Farrugia and Peter Felton. Laurie also collaborated effectively with the Medical Team in dealing with athlete injuries including groin and ankle injuries, muscle-strains and other musculoskeletal injuries. “It was amazing being part of a professional medical team at such a world-class sporting event,” Farrugia said. “In the first couple of days, everyone in the team was pretty quiet as they got to know each other, but after that initial period, the work dynamic within the team was absolutely outstanding. You could really get a sense of the mutual trust and respect within the team. “The way all the health disciplines worked together was so great – if I could use an analogy, it was like a jigsaw puzzle. Once the puzzle came together, you could really see a definitive picture that truly represented the role of the medical team,” Farrugia said. 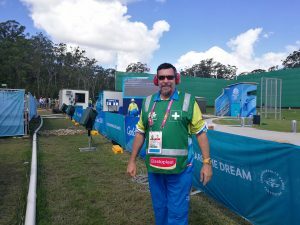 Michael McGuinness, Sports Trainer and Queensland Course Presenter, also volunteered at the Games and was based at both the velodrome and shooting range. “All I can say is WOW! It has been such a rewarding experience and I’ve developed a real respect for the athletes as they train. Working alongside the allied health team was just awesome,” McGuinness said. 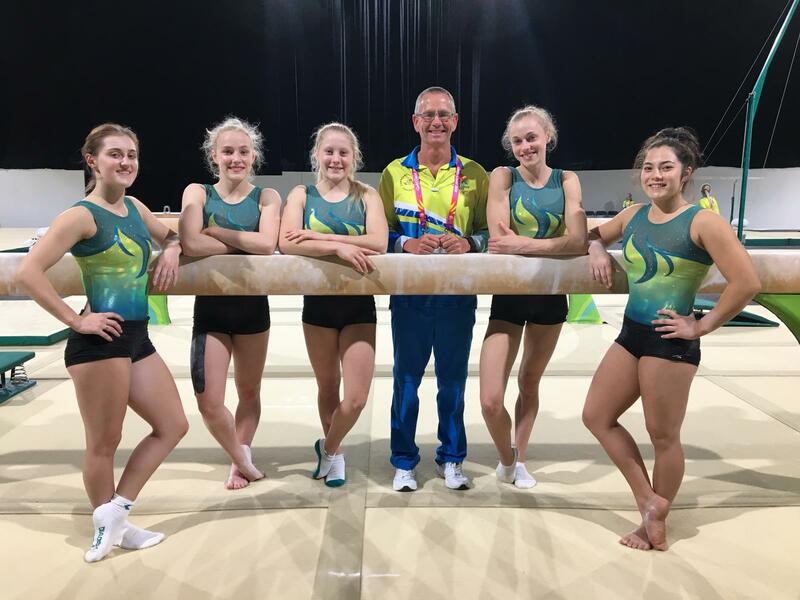 With these Commonwealth Games being only the second to include Sports Trainers as part of the Medical Team, many of the other medical professionals in the team were unsure of what to expect from Sports Trainers in terms of expertise. “Definitely, some of the allied health team were surprised at the skill-set and capability of Sports Trainers. I know from first-hand experience, when I was dealing with a wound at the Games, the supervising doctor was more than happy for me to manage the patient and left me to it,” McGuinness explained. “I found that there was a level of respect I haven’t seen shown anywhere else towards Sports Trainers. For example, I was asked to lead our crew through a training scenario, which is usually left to the doctor to do. “Everyone just worked together as one and all the teams were really welcoming and engaging. An amazing experience to be part of, for sure,” said McGuinness. For more information about becoming an SMA Sports Trainer, click here.